Lucky day, 1st and 2nd prize! Wow it was definitely my lucky day, there was over one hundred great artworks by many talented artists on display at the Casada Country Club! They called out the winners of the art competition in reverse order starting from the novice category and working to the advanced. Anxiety combined with curiosity when it was declared that there would be no 3rd place in the advanced category. This being because two artist have come to a draw in second place due to accumulating the same number of points. First called was Glyn Whiting who I had just met and had been having a pleasant conversation with. Next up was Ronen Zlotogoura! we both thought the irony of that was quite funny. 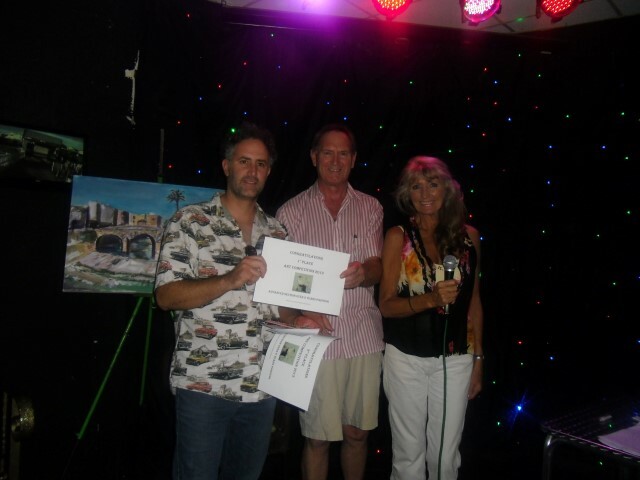 Then came the first prize announcement “Pink Cadillac by Ronen Zlotogoura” and off I was back to the stage with a big smile. It was really an honour that the judges appreciated my work and considered it worthy of a prize let alone two. This encouragement has enthused me to get back to the studio and continue painting. Thank you Susan Reader, Susan Sayers, Casada Country Club and all who worked hard to organise such a great event. Also a massive “THANK YOU” goes to everyone who attended giving positive comments and support to the local artists. Fantastic work Ronen, really looking forward to seen your next work of art. Fully deserved first prize. Thank you Sean, that’s very kind of you, the next painting is a bright red Ford Lorry from the 40’s or 50’s, some pictures will be posted soon. Can’t wait to visit you guys at Picoyas Art Shop in Benijofar and use up my vouchers!